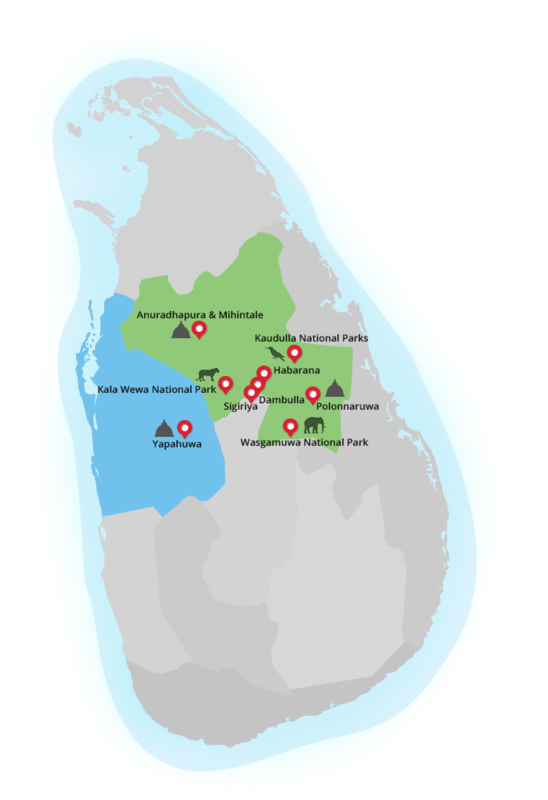 Lying at the foothill of the Knuckles mountain range is the Wasgamuwa National Park. Due to its remote location, the park is seldom visited and the crowds tend to stay way which gives you a tranquil wildlife viewing experience. Wasgamuwa is steeped in history and the plains in Yuda Ganapitiya are believed to be the site where King Dutugemunu fought and defeated the Chola King Elara in 161 BC. The Mahaweli river flows through the border of the reserve where you get dense riveting forests with large trees. The remainder of the park comprises mainly of savannah like grassland and scrub jungles. There are a number of man-made lakes and waterholes that are scattered across the park to attract the wildlife. Elephants are the highlight and large solitary bulls along with small herds comprising of females and their young can be encountered on most days often at close range. Sloth Bear and Leopard are found in these jungles but are seldom seen. Mugger Crocodiles and Buffalo can be seen around the numerous waterholes while herds of Spotted Deer and the occasional Jackal can be seen in the open plains. Wasgamuwa is also an excellent birding location where in addition to the resident dry-zone species including the endemic Sri Lanka Jungle-fowl and the impressive Indian Peacock, a large number of raptors including the majestic Black Eagle and numerous species of waterfowl.